Here is another card I did for the Eyelet Outlet blog. I already had the large dragonfly die cut and glittered, so I knew I wanted some little ones to go with it. Eyelet Outlet to the rescue!! My papers are from the He Said She Said paper collection and my sentiment is one I typed on my computer and printed out. My finishing touch was to add some green bling (also from Eyelet Outlet). I hope you liked my little card today. I'll be right back here tomorrow with yet another fun project to share. 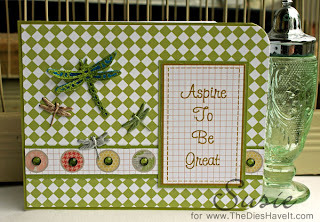 Super cool card, the dragonflies are awesome! !